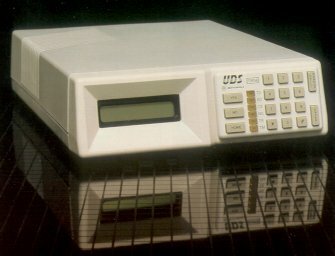 The UDS Motorola SW56 II, combining a DSU and CSU in one unit, operates at all DDS line rates. The front panel keypad simplifies dialing and operation. Combining the functions of a Data Service Unit (DSU) and a Channel Service Unit (CSU), the high-speed and versatile UDS Motorola SW56 II is designed to be used on the ATT ACCUNET or US Sprint switched digital networks as well as conventional digital networks. The SW56 II meets all specifications outlined in Bell Publications 62310, 41458, and 41450. With six status LEDs, a 32-character alphanumeric LCD, hexadecimal keypad, and five function keys, the SW56 II is remarkably easy to operate. Operating parameters are readily observed and changed through the LCD menus and function keys. The SW56 I I can operate over the full range of DDS line rates from 2400 bps to 56000 bps. When connected to a 56K bps digital line, the SW56 II can adapt DTE data rates from 2400 to 19200 bps to the 56K line in either synchronous or asynchronous format. When operating over the ACCUNET or Sprint switched digital networks, the SW56 II can accept dialing information from either the dialer port or the front panel. All calls are originated using specified pulse-dialing techniques with call progress information and echo-cancellation used on the Sprint network. Incoming and call progress information can be monitored by speaker. A receiver automatic line equalizer compensates for distortion and attenuation caused by DDS line length. The SW56 II has interchangeable DTE interface cards that allow a choice of EIA232D, EIA-530, or V.35 interfaces with the DTE and should be specified when ordered. The SW56 II has a number of diagnostic tests available for troubleshooting problems. To simplify operation, the LCD menu displays only the tests available in the current configuration.